Posted August 10, 2015 by The Rapid & filed under News. ROUTE 2: Schedule times will be adjusted along the route in an effort to enhance schedule adherence. ROUTE 8 & 44 STOP RELOCATION: The bus stop at RiverTown Crossings is being relocated to the east end of Macy’s on the front side of the mall. 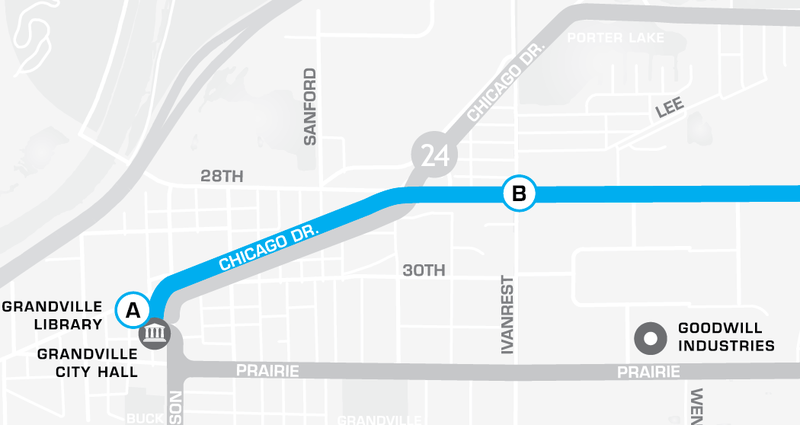 Westbound: 28th Street west to cross over Ivanrest, right on Wallace to Chicago Dr., left on Chicago Dr., to Wilson, left on Wilson to Grandville Library. Westbound: Wilson to 44th, left on 44th to Canal, left on Canal to Lowes. Eastbound: Canal to 44th, right on 44th to Wilson, right on Wilson to RiverTown Crossings. ROUTE 50: This route will no longer go to Rapid Central Station and will transition to Laker Line routing. Westbound from Lafayette (CHS): Lafayette to Hastings, left on Hastings to Coit, left on Coit to Michigan, right on Michigan to Monroe, left on Monroe to Fulton, right on Fulton to Laker Michigan to Allendale GVSU campus (Kirkhof). Eastbound from Kirkhof: Campus Drive to Lake Michigan, Lake Michigan to Fulton, right on Fulton to Monroe, left on Monroe to Michigan, right on Michigan to Lafayette, left on Lafayette. Eastbound stops: Kirkhof Center, North Campus & Ravine Center, Lake Michigan & Wilson (Meijer), Lake Michigan & Kinney, Lake Michigan & Collindale, Lake Michigan & Bona Vista Drive, Lake Michigan & Covell, Fulton & Garfield, Pew Campus: Fulton & Mt Vernon, Monroe & Louis, Monroe & DeVos Place, Michigan & Bostwick, Lafayette at CHS. ROUTE 51 HILL DASH: This route will now run from 6:30 a.m. – 6:00 p.m. on a 15-minute cycle. Hill Dash will no longer travel to the CHS building. The new routing will include travel on Michigan to Barclay, turn right on Barclay, and continue on current routing back to Seward.